I just noticed today that the Office corner of MSDN has had a facelift, and for the better! Check it out: http://msdn.microsoft.com/en-us/office/default.aspx I'm very impressed with the level of documentation and detail about Office and SharePoint 2010 when the product isn;t even released yet, can't wait to see what it will look like towards the second half of 2010. Obviously I need to point you in the Visio direction, those of you that know me have probably seen me present on a few occasions now and I am very keen to share the knowledge and power of Visio 2010 and Visio Services; http://msdn.microsoft.com/en-au/office/aa905478.aspx. I'm building some exciting solutions using Visio 2010 and SharePoint 210 and will be sharing all about that soon. I have seen, and get the question about the Visio Mash-up API a lot, this is what you would use to implement great interactive solution with Visio Diagrams published to SharePoint. Which brings me to aim the spotlight on the Visio Team blog where they have been extremely busy posting all of the little nuggets you'll need when you want to get serious about using Visio in custom solutions. 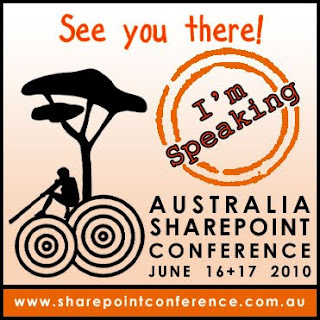 Lastly I'd like to share the news that I have been invited to speak about SharePoint and Visio at the SharePoint Conference in Sydney, Australia.